Marcel Cornelius Shipp was born August 8, 1978 in Paterson. He was raised by his mother, Ida Shipp, as a single parent in Paterson and later Passaic. Swift, strong and muscular, Marcel excelled in a number of sports as a boy. Marcel became a starter for John Iurato’s Passaic County Tech as a sophomore, contributing to a team led by future NFL defensive stars Gerald Hayes and Mike Adams. As a junior, he surpassed 1,000 rishing yards and was named All-Area by the Newark Star-Ledger. In his senior year, Marcel ran for more than 1,500 yards and 24 touchdowns to earn All-State honors. PCTI, a vocational school with a great football tradition, did not prepare Marcel academically for a top college. Recruited by the University of Massachusetts, he decided to spend the 1996–97 academic year at Milford Academy in upstate New York. He made his debut at UMass in 1997 and became the starting tailback in his third game. Marcel’s 756 rushing yards set a school record for freshmen. As a sophomore for the Minutemen, Marcel gained national attention and Second-Team All-America honors with 2,542 rushing yards and 18 touchdowns. He added four more touchdowns on 39 receptions and led UMass with 132 points. In a game against Northwestern he set a school record with 277 rushing yards. His 181.6 rushing yards per game smashed the old school record. The Minutemen advanced to the 1998 Division I-AA championship game against Georgia Southern and Marcel outdid himself with 35 carries for 244 yards and three touchdowns in a 55–43 victory. The championship marked one of the great turnarounds in NCAA history, as the Minutemen improved from 2–9 to 12–3 and a championship trophy. The win was a huge upset, as Georgia Southern came into the game 14–0 with four championships under its belt. Marcel had another great year as a junior. He ran for 1,846 yards and 24 touched, and upped his receptions to 54. The Minutemen returned to the Division I-AA playoffs, and in an opening-round victory over Furman Marcel caught the winning pass in overtime. The quest for back-to-back championships ended in a revenge match against Georgia Southern. This time, the Eagles won 38–21. Marcel was named First-Team All-Atlantic 10 for the third year in a row, concluding one of the most spectacular Division I-AA careers in recent history. Marcel decided to turn pro in 2000, but went undrafted. 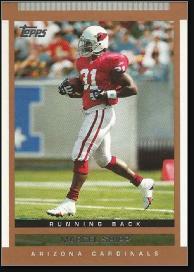 He was unable to make an NFL roster in 2000 but caught on with the Arizona Cardinals in 2001. He saw action 11 games on special teams, and returned 6 kicks. In 2002, Marcel subbed in for Thomas Jones when he was injured at midseason and ended up leading the Cardinals with 834 yards and 6 touchdowns. He also caught 38 passes and scored another 3 TDs, including one for 80 yards. In 2003, Marcel teamed with veteran Emmitt Smith in the Arizona backfield. He led the team in rushing again with 830 yards. In a game against the 49ers, he ran for a career-best 165 yards. A badly broken ankle suffered in training camp kept Marcel off the field for the entirety of 2004. He returned in 2005 to lead the team again with 451 yards, but he was not the same player. With the acquisition of Edgerrin James, Marcel was relegated to backup duty in 2006 and again in 2007. He was released during camp in 2008, quickly signed with the Houston Texans, but did not make the team. Hoping to stay in the game, Marcel signed to play with the Las Vegas Locomotives of the newly formed United Football League in 2009. He helped the Locomotives win the UFL Championship in 2009 and 2010, and return to the title game a third straight year in 2011. The UFL folded during its fourth season. At 33, Marcel decided to call it quits, but his UFL experience gave him a taste for coaching. In 2013, Bruce Arians (a fellow Paterson native) invited him to join the Cardinals coaching staff.